The core of this book is a set of five lectures delivered by Habermas at Princeton in 1971 under the title 'Reflections on the Linguistic Foundation of Sociology'. These lectures offer a preliminary view of what would become The Theory of Communicative Action, and they form an excellent introduction to Habermas's ideas about communication and society. They lay out the general parameters of Habermas's project in an accessible way, and situate his work in relation to other theories of society, particularly those of Edmund Husserl, Wilfrid Sellars, and Ludwig Wittgenstein. Two additional essays elaborating the themes of the lectures are also included in this volume. 'Intentions, Conventions, and Linguistic Interactions' is an essay in the philosophy of action that focuses on the validity of social norms and examines the conceptual connections between rules, conventions, norm-governed action, and intentionality. 'Reflections on Communicative Pathology' addresses the question of deviant processes of socialization and contains an analysis of the formal conditions of systematically distorted communication. 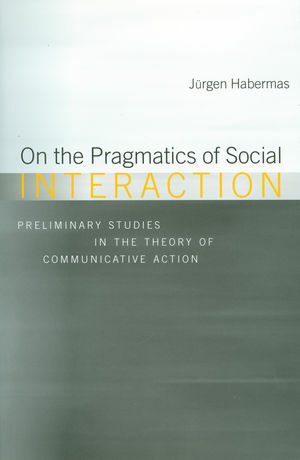 This book was designed as a companion to On the Pragmatics of Communication (1998), which took pieces from Habermas's later work to create a systematic introduction to his theory of formal pragmatics. Jürgen Habermas is Professor of Philosophy Emeritus at the Johann Wolfgang Goethe University of Frankfurt.